At long last, the Banner Design Competition is here! As you can see, the current banner at the top of the Hijab Style webpage is looking a little plain, and could definitely use a makeover! So here is your chance to design a new one and win some fantastic prizes too! 1. 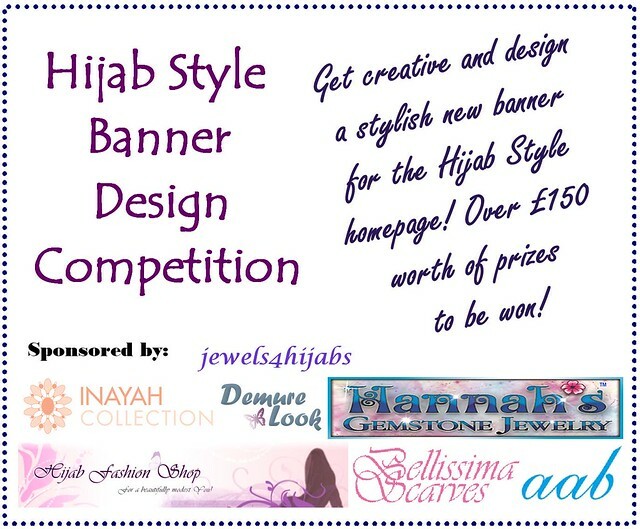 The banner must include the blog title 'Hijab Style' and description 'The UK's first style guide for Muslim women', as it already does, but you can play around with the layout. 2. You cannot use existing images found on the internet, as these already belong to someone and cannot be used to promote another website. Stick to graphic designs only. 3. You can use any colour schemes and fonts you like, but bear in mind that it needs to be easily read. 4. Banners should preferably be in .jpg format, but .bmp images are also acceptable. The width should be exactly 920 pixels, and the height between 220 and 250 pixels. 5. Each entrant may submit upto a maximum of 3 designs each. 6. Deadline for entries is Monday 5th September 2011 and the competition is open to entrants from all countries. 8. The first prize winner will be chosen by myself, and there will be a poll open to all Hijab Style readers to choose the runner-up. Oolong Blue Abaya from Aab; Genova Matt Silver Scarf from Bellissima Scarves; Silk and Viscose Stripe Scarf from Demure Look; Agate Two in One Chain Link Necklace from Hannah's Gemstone Jewellery and Set of Handmade Hijab Pins from The Inayah Collection. Striped Hijab in Dusky Pink from Hijab Fashion Shop and a Burgundy and Gold Filigree Dangle Hijab Pin from jewels4hijabs. Remember: keep it simple and stylish. I look forward to receiving your entries! could anybodyy please reccomendd a website or anything which i could make my banner on ?? Mashallah! This is right up my ally so to speak, I have already made three images and sent them in. I hope the files work! That pink hijab is beautiful!